Corning Olive Oil Company is built on the family traditions of Greek businessman and long-time olive grower, John Psyllos. In 1990 when John sold his olive cannery to Bell-Carter Foods, he went back to his roots and established this olive oil mill in the Northern Sacramento Valley community of Corning, California, the “Olive Capital of the World”. Keeping with him a small crew of key people from the olive cannery, John imported the mill equipment, purchased the necessary supplies and fruit from local orchards and pressed his first extra-virgin olive oil in the fall of 1990. That first year his inventory grew to 25,000 gallons of world-class extra-virgin olive oil. Over the years this facility has had several owners and has finally come full-circle, having been purchased by Ray and Kathy Rogers who have a combined experience of 27 years in the California olive oil industry. They still believe in that "family tradition" which founded Corning Olive Oil. Quality and customer service above all. In keeping with that tradition, Corning Olive Oil Company purchases the freshest, hand-picked California olives available. By closely adhering to the California Health and Safety Codes in all our production practices, we are able to produce an extra-virgin oil of exceptionally fine quality that has gained the acceptance of gourmet chefs with it’s smooth, fruity and naturally delicious flavor and beautiful color. 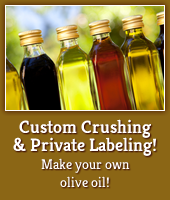 With the same dedication to our customers products, we custom crush your fruit, rack, blend and bottle your oil to your specifications. Contact us to see how we can put our expertise to work for you.